I think he's arguably the best in the business right now, and we loved the show, but I'm not here to write a comedy review – I'm here to show you how to make and keep money in the stock market. …because there are some really bad choices investors make that would leave anyone asking, "Why would you do that?" Why Would You… Trade Without a Plan? Too many people jump into the stock market as a way to "get rich quick." Now, I'm all for getting rich quickly, but you just can't do it without some sort of plan. And the best one to use – my personal favorite, in fact – is rules-based trading. 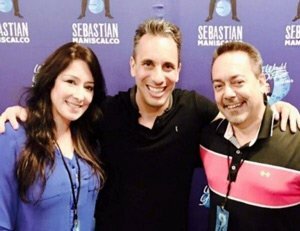 Tom, his wife, and Sebastian Maniscalco last weekend. Like this guy says: "Why would you do that?" This is basically planning your trade and trading your plan, no matter what the headlines are saying or the markets are doing. You've got a clear set of rules. You're not trading on emotion (which is the fastest way to lose all of your money), and you're not just guessing and hoping for your trades to work out. That method isn't something you can quantify or back test – it's really not a method at all. You'd never buy a house or a car without knowing exactly what you want, how much you're willing to pay, and when you want to pay it off. So why would you ever put your hard-earned money into the markets without knowing exactly what you want, how much you're willing to pay, and when you want your profits? 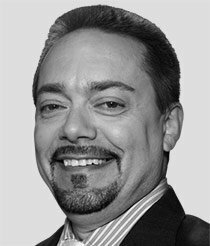 Why Would You… Buy and Sell Stocks as a Short-Term Profit Strategy? Now don't get me wrong, I love investing in and buying stocks – as a long-term strategy. Buying and holding stock for the long term means you're willing to sit through the bullish and bearish cycles for those big returns down the line. It also means you're primarily focused on a company's revenue and earnings (fundamental analysis) instead of patterns and market data such as price and volume (technical analysis). Earnings and revenue can be tricky, though, to put it mildly, and can take years to work out for your portfolio. Take Amazon.com Inc. (Nasdaq: AMZN)… Anyone who bought the stock during its initial public offering (IPO) has turned a $1,000 investment into a $638,000 today – 20 years later. Remember, though, the stock also dropped nearly 90% in 2000, which caused a lot of investors to sell their shares. But there's a much, much better, more profitable way… options trading. With options, you basically "rent stocks" for much less than you would to buy them outright. And instead of paying up to thousands of dollars for a single share, you get to control 100 shares at a time for much less. Options also reduce your risk, giving you leverage in the markets, and deliver profits much, much faster. You're talking about days, weeks, or months to make money – not two decades. Furthermore, it doesn't matter if the markets make record highs, record lows, or don't move at all… there's a safe and easy way to profit no matter what. So why would you ever waste thousands of dollars buying single shares of stock to hold in the short term (with little chance of recouping that money)… when you can double or triple your money for a quarter of what you'd pay to buy the stock outright? Why Would You… Bet the Farm on "That One Chance?" I have been reading all your comments about this big marijuana market, but what I've seen lately with the companies you've discussed is they are going down not up.